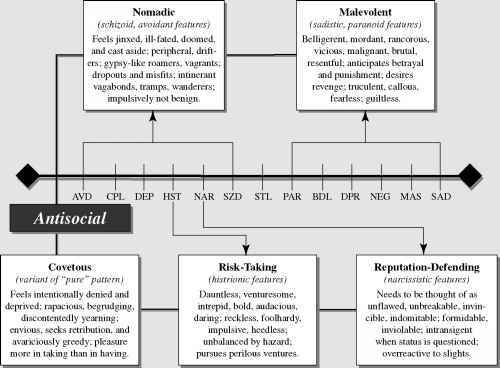 The evolutionary model (Millon, 1990) holds that the schizoid and avoidant shade gently into the schizotypal; thus, these personalities naturally form structural subtypes for this pattern (see Figure 12.1). Actual cases may or may not fall into one of these combinations. The insipid schizotypals represent a structural exaggeration of the passive-detached pattern. Like the schizoid, they are notably insensitive to feelings, seem indifferent to the external world, and appear drab, unmotivated, apathetic, inexpressive, sluggish, and joyless. Insipid schizotypals, however, exaggerate even this. Being detached, they have no connection to the external world. Being passive, they generate nothing inside themselves that might give substance to their identity. FIGURE 12.1 Variants of the Schizotypal Personality. is monotonous, listless, or even inaudible. In some cases, depressive and dependent features may also be present. Developmentally, insipid schizotypals are likely to have had family atmospheres of excessive indifference, impassivity, or formality. The family provides an important model for lifelong patterns of social reticence, interpersonal insensitivity, and discomfort with personal affection and closeness. Styles of fragmented and amorphous communication, complicated by disjointed, vague, confusing, and pointless interactions, are probably also a factor, leading to unfocused and irrelevant interpersonal relations. Given emotional deficits that flatten otherwise rich experiences and cognitive obscurities that further blur important distinctions, the opportunity for having satisfying interpersonal experiences is lost. Unable to communicate with either affect or clarity, they likely were shunned, overlooked, and invited to share few of the more interesting experiences to which others were drawn. Failing to interchange ideas and feelings with others, they remain fixed and undeveloped, continuing, therefore, in their disjointed, amorphous, and affectless state. Restricted in their social experiences, they acquire few social skills, find it increasingly difficult to relate socially, and perpetuate a vicious circle that fosters their isolation and accentuates their social inadequacies and cognitive deficiencies. Timorous schizotypals represent a structural exaggeration of the active-detached pattern. 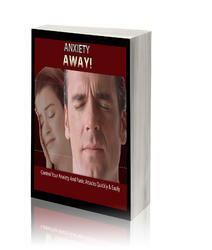 Like the avoidant, they are restrained, isolated, apprehensive, guarded, and socially shrinking. In contrast to the insipid variant, apathy and indifference are used protectively to damp down their sensitivities, feelings, and desires. Some develop exaggerations of avoidant scanning and hypervigilance, becoming drawn to strange signs and omens through which protective guidance can be obtained and malicious events controlled or averted. They may focus on irrelevant details or those that would escape the ordinary person and develop superstitious behaviors or rituals. Many devalue the self so completely that they deliberately confuse their own cognitive processes as a means of avoiding what is presumably rational and objective. Others turn the fantasy life cultivated by some avoidants into perceptions that are normally beyond the five senses. In effect, they create a new inner world populated by magical fantasies, illusions, telepathic relationships, and other odd thoughts that provide them with an existence more significant and rewarding than that found in reality. Others seek to jettison the self completely, voiding their identity and following a path similar to that of their insipid counterparts. 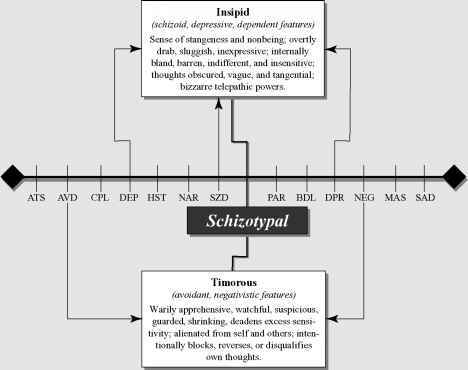 Timorous schizotypals are excessively apprehensive, particularly in social encounters, exhibiting agitation and an anxious watchfulness. Most exhibit a distrust of others and a suspiciousness about their motives that rarely recede despite growing familiarity. Developmentally, timorous schizotypals were likely exposed to belittlement, rejection, and humiliation. As a result, they have low self-esteem, feelings of incompetence, and a marked distrust of others. As a result of such harsh treatment, they protectively keep their distance from others, wall off from society, and insulate their feelings. Eventually, they avoid interacting with others at all, fearing that any amount of contact might lead to some negative appraisal. So convinced are they of their lack of worth that many come to denigrate themselves. Of the two subtypes, Neal more closely resembles the timorous schizotypal.